"Ma," said Hosh. "Is there a dish I can serve to almost anyone, anywhere, anytime? Teach me something that is cheap, quick and easy to cook, versatile and nutritious." "You don't ask for much, do you?" Isha smiled at him. "Nope," he smiled back at her. "I'm easy to please." "Dahee," she answered, "or yogurt, fits those specifications. It is a healthy holistic food, which we have been consuming from ancient times." "The word Dahi comes from the Sanskrit word dadhi, which is one of the five elixirs, or Punchamrit, often used in Hindu rituals." "It is still the most important fermented milk product consumed in the Indian subcontinent. Although it is made from cow and goat milk too, Buffalo milk is widely used for its extra fat content." 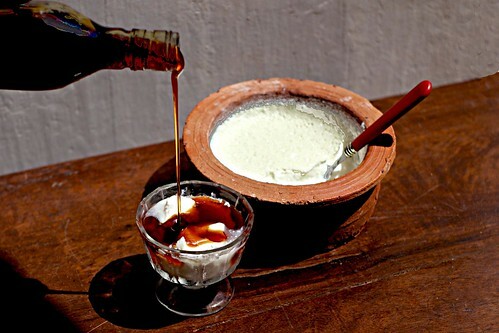 "I make Dahi the traditional way, using full cream milk, which yields a thick and luscious yoghurt. But really, using any good quality milk is fine too. I always boil the milk before making curd, so the milk does not spoil during fermentation." "Interestingly, homemade yoghurt turns out to be much cheaper and more delicious than the bought ones." "Let's heat the milk to a boil now," she instructed, "on a stovetop (approx 180 degrees Fahrenheit) or in a microwave. I never let it boil over, because I don't want to clean up the spillover mess later." "When it reaches a boil, turn down the heat and let the milk simmer for a minute or two. Then close the burner or remove the milk from the microwave. I leave it alone now to gradually cool down at room temperature, until it is slightly warmer than lukewarm (approx 115 degrees Fahrenheit)." "Ideally, you need it to be around body temperature for thick consistency. You can check the temperature by dipping your finger in, if you don't have a thermometer." "Now add curd (or starter yoghourt) culture to the milk and stir. Mix well. It is very important to dissolve the culture uniformly in the milk. Then transfer this mixture to a container with a tight-fitting lid. You can use the same pan in which you boiled the milk, if it has a lid." "This Starter yogurt can be from a previous batch you made, or if you've got no curd left over from earlier, you can buy a small single-serve Plain Yogurt from the grocery store or supermarket." "Starting from a culture is easiest, but I'll show you a video of what to do if you have no leftover curd and no culture. The most important thing though, is to get the milk temperature just right." "If you add starter yogurt into hot milk, milk may coagulate, and you might end up getting a grainy curd. In very hot milk, the yogurt bacteria might even die, so curd may not set at all." "So milk should feel warm, not hot and not cold. Dahi will not set at all, if the milk is cold. If milk is less than lukewarm, Dahi will not thicken. It will remain a bit runny with some whey in the curd." "In countries like New Zealand, where it is cold most of the year, it is best to now put the curd mixture container in hot water inside a plastic Yoghurt maker. Or just store it in a microwave or oven." "Oven or Microwave?" Hosh was surprised. "Wouldn't it be cold inside them too, in winter?" "They keep warm for some time if you preheat the oven to 180 degrees Fahrenheit first. Or turn on the empty microwave for about 3 minutes. Then switch it OFF. You can now safely place your container in them and leave the curd to set." "In North India, Nepal and Bhutan, people wrap these containers either in a blanket, warm cloth or hay, or put them in straw-boxes and keep them in warm places to keep the souring temperature as even as possible." "My mom used to place the bowl in a bigger jar of wheat flour and then cover the jar. But you don't need to insulate this container if it is sufficiently warm anyway, like it can be in summers." "Your curd is all ready to set now. Keep undisturbed at room temperature for 4-5 hours in warmer climes or until the curd is set in colder climates. I keep it overnight anyway, even though curd sets faster in summer than in the winter." "If you prefer tart (sour) Dahi, leave the mixture container in the warm oven for 5-6 hours in colder climes. In warmer climates, the longer you keep it outside after it is set, the sourer it becomes." "Otherwise, refrigerate it once the curd is set. You can now eat it either plain, sweetened or salted, or make Raita, Lassi, desserts or other Yoghourt dishes with it." "How long will it keep in the fridge Ma?" asked Hosh. "It is best to use it within a week in winters," she answered, "and within three days of making it in summers. It will last a bit longer than that in the fridge though."